I haven't marked my father's grave. It's been almost two years since my father died and I buried him in a grave at Steelmantown Cemetery, a natural burial ground in southern New Jersey. Ed Bixby keeps a supply of field stones dug up during maintenance of the cemetery for use as grave markers, but at the time of my father's death it was all the family could do to hold ourselves together through grief and the logistics of death. Getting him safely in the ground was the priority, though before leaving the cemetery we picked out a stone that would go across two graves, as my mother will one day be buried in the plot that lies next to him. I fully intended to have the engraver pick up the stone and finish it; we even had a tentative wording picked out. But first the stone seemed awful big for the purpose, even if my mother would be memorialized too. Then family dynamics deteriorated and talk of what to say evaporated. I knew where he was buried; the rest of the family is scattered across the country and wouldn't be able to find the plot on their own. Finally I decided in a huff that if no one else was interested in the stone then why should I make an effort? As time went on family relations smoothed out and we talked about it again. I even went so far as to pick out a new stone, just for my father. All these things, though probably pretty common in the stages of grief and reaction to death, seem petty. Yet my father's grave still has no stone, even though we are all talking to each other again. Why? And does it matter? Mostly what drives me to worry about the stone is guilt. I feel like I should mark my father's grave. Yet I'm not sure it would matter to him. My husband's choice of words would have been "Ed Hoffner--A Pretty Good Man." He wasn't without ego but he wasn't into fuss. He was the kind of man who figured out how to make pockets on the backs of his pants by sewing on pieces of cloth, because it was the easiest way to get it done and he didn't mind how it looked. Memorialization is a personal matter but it's also a collective choice. 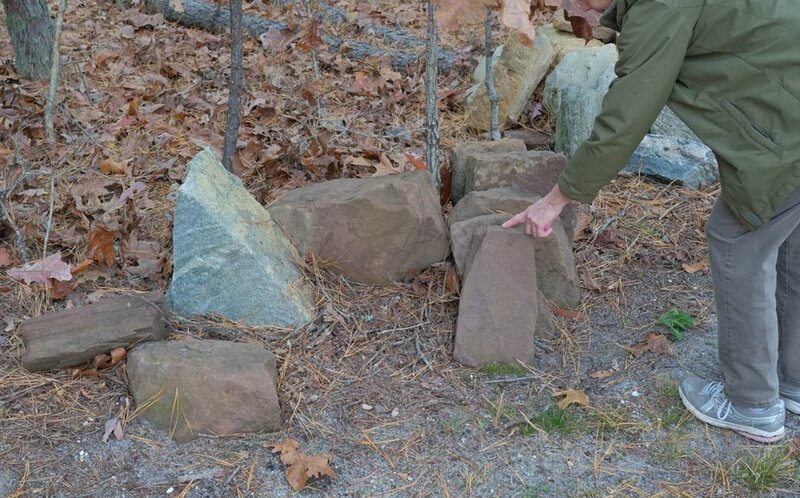 Green burial cemeteries choose to forgo polished cut stone grave markers in favor of markers that resemble what comes out of the earth, either stone or plant, and in some cases opting for group memorials instead of individual grave markers. It's important for those of us who choose green burial to understand what we're comfortable with, and then to make an appropriate memorial within the bounds of what the collective cemetery allows. After all, even conventional cemeteries have carefully laid-out rules about memorialization. Like anything else, choosing how to memorialize someone can be fraught with uncertainty if done when death occurs. If you haven't planned ahead of time, it's okay. The earth always takes time to settle, and the person you are thinking about is not going away. Older PostDuck Run is for ducks and humans.